Last month, we suggested two resources to read on planning your garden. Using these resources we asked you to make honest observations about your existing conditions such as sun, shade, soil type, slope and exposure to prevailing winds. Planning your garden with those requirements in mind will lead to the greatest successes, and will help you avoid many disappointments. With your existing conditions in mind, where are the best places for ‘soft’ or planting areas such as trees, shrubs, perennial and annual vegetables and flowers? How about the views from your landscape to the one next door, would you like to screen that view? Your plan should include easy access to and from any new ‘hard’ areas, such as patios, decks, play areas and walkways. Also consider access to the gardens from water sources, and compost areas. Whether you are starting totally from scratch, or adding to your existing landscape, this is the time to complete your site plan. Starting with the plan you drew last month of your property, draw in the proposed new ‘hard’ and ‘soft’ areas, including access points mentioned above. Now is the time to map it out. Choose a warmish day and go out into your landscape. Armed with your sketch, stakes or garden staples, and some yellow string, outline these proposed new hard and soft areas in your yard. Pound in a couple of wood stakes where you want to plant your trees and shrubs. Take the time to walk through your new garden; move around the area to see how this layout works for you. Pull out a chair and sit on your proposed patio; what views do you see? Imagine gardening in the new garden, and ask yourself some questions. What access paths do you need? How far away is that water source? This is a great way to see if the sidewalk is wide enough, the play area is the correct size, if the garden too far away from the rain barrels, or compost bin, etc. Update your site drawing with any revised measurements of your new areas. You will need these measurements to come up with numbers (i.e. square footage) to price out your material needs in the November Self article. 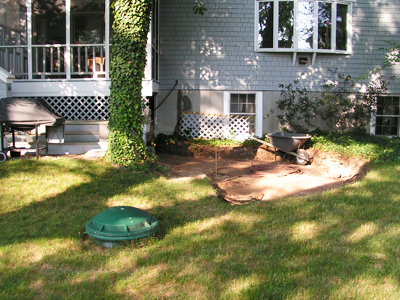 Once you are sure that you have the right location for your new garden bed, you can do some preparation for next year. You can prepare the bed in a manner that will ensure the soil microorganisms are alive and working in your garden soil throughout the next 6 months. One great way to prepare the soil for spring without turning over the soil or tilling is to layer the ground with newspaper, corrugated cardboard and compost material. 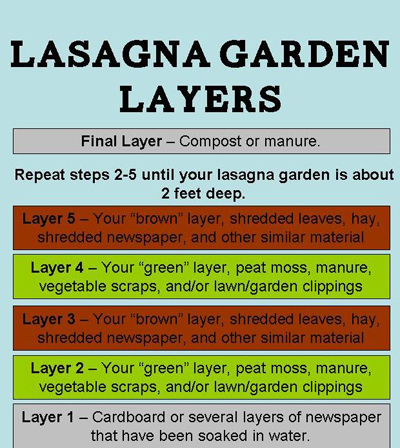 Start by placing 2-3 layers of newspaper down on the measured area that will be the new garden. Now add corrugated cardboard in a single layer on top of the newspaper. Use only cardboard that does not have glossy printed pictures on it. Using garden or landscape stapes or stakes, tie a strong nylon string to the stapes and lay the string across the cardboard to keep the wind from blowing the cardboard away thru the winter. Now add composted material on top. This could be composted cow manure, leaves that have been chopped and bagged by your lawn mower, or some of that great humus available from your own compost bin or from the town’s yard waste site. You will want a minimum of 4 to 6 inches of the compost. Now the magic happens. Any grass or weeds are suppressed by the cardboard and no longer grow, but microorganisms in the roots of the grass and weeds will work through all the layers. In the spring you will have a garden bed ready for planting, without any hard work. This is the method that the Master Gardens used to create the Memorial Garden at the Hospice of the Fisher Home in Amherst in the fall of 2015. Once your garden is done for the season, be sure to clean the garden thoroughly. You will want to remove all debris from the soil surface so that any potential problems won’t winter over to resurface in next year’s garden. Now that the garden surface is clean, it is time to prepare it for winter. This is the time to add organic material to feed the soil microorganisms through the winter months. Consider adding a cover crop to keep the soil from drying out and the soil microorganisms from dying in winter.Read our article on Cover Crops in Soil this month. If a cover crop is not an option, provide about 2-3 inches of composted material such as chopped leaves to your garden bed. The leaves will decompose during the winter, providing organic material and nutrients to your soil throughout the winter. Homework: Complete your site plan. Read Northeast Smart Garden Regional Guide by the American Horticultural Society. Part 1, Access your Site and Adapt When Necessary. Some of this is a repeat of the soil book, but worth re-reading. The Vegetable Gardeners Guide to Permaculture by Christopher Shein with Julie Thompson. Read section 3, Designing the Permaculture Garden; and Section 4, Building the Soil.